As part of a graduate course I’m teaching this semester on “Creativity, Literacies, and Collaboration,” I’ve asked my students to engage in creative play for at least 1 hour per week for 6 weeks, to document their experiences, and to reflect on them in a personal blog. I’ve decided to complete the assignment with them so that we can learn together about the phenomenon of creativity from a personal perspective. We’re working under a few constraints. What motivated me to jump into this project feet first? What apprehensions/fears will I experience in trying an activity outside of what feels familiar to me? What can I do differently the next time I participate in this process? Is it important to me get better or to be good, or is the activity of play rewarding in and of itself? Does the activity affect my emotional or psychological state at all? Do I feel differently about the activity (or about myself) after I participate in it? I devoted a lot of thought to my choice, ran it by my family and friends, and ultimately went with the one that energized me the most. (Learning to play the electric guitar was also a strong contender.) I wanted it to be an area where I had very little to no expertise and background knowledge and that had absolutely nothing to do with my day job. 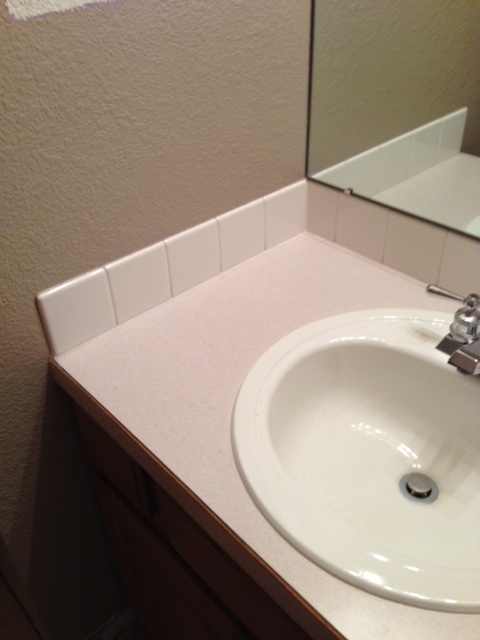 My choice was to do a small-scale renovation of the powder room in our new (old) house. This initially seemed like a safe and reasonable choice, but now I realize that this is the only bathroom on the main floor and probably the only one regular guests will see. Oh well, too late to turn back now. 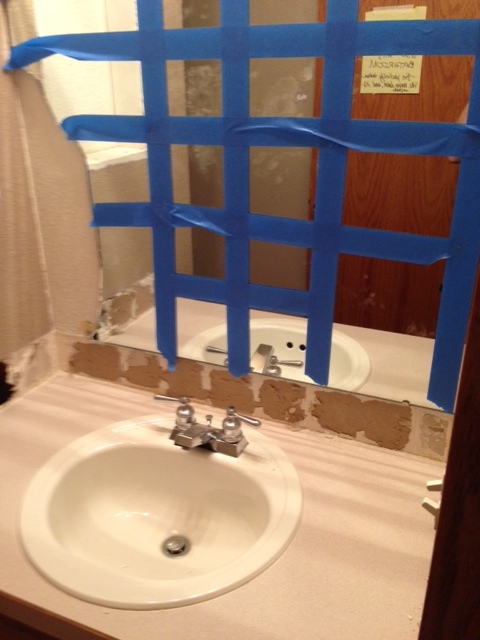 In the interest of full disclosure, I knew what I’d need to get started because we’re in a full-scale remodeling of the entire house and are putting a lot of sweat equity into the process. When we started demo of our master bath last week, I learned a bit about removing tile by watching a YouTube video then plunging right in. The first thing I discovered was that the process was much more difficult than the video made it appear. My tiles didn’t pop neatly off the wall with a satisfying little chink like they did in the video, and sometimes they didn’t pop off at all. 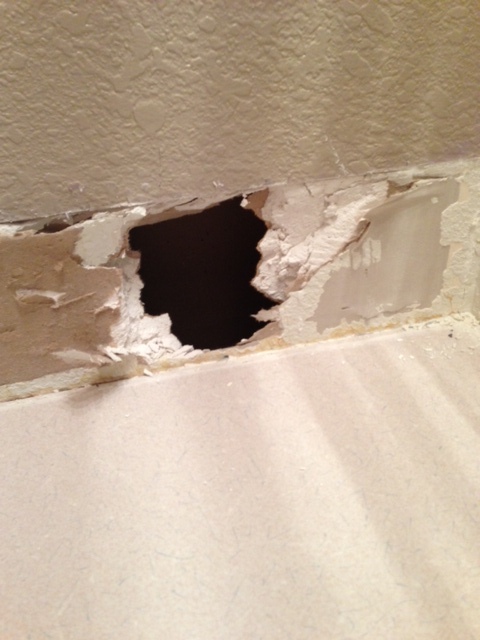 Eventually it became clear that drywall repair was inevitable; at that point, a sledge hammer became my tool of choice. (I literally made sparks fly. It/I was awesome.) From that experience, I learned that I need the above tools. Leather gloves are a must because porcelain can break into tiny sharp slivers that can (and did) pierce the skin. For the same reason, safety glasses are needed to protect the eyes. 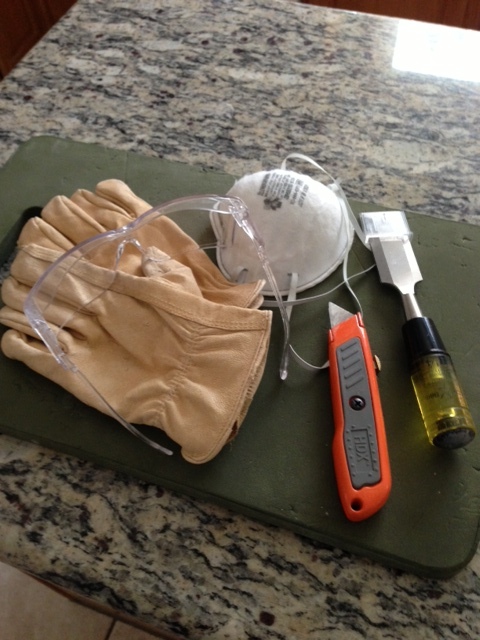 If things get dusty, a mask can help, and an exacto knife scores grout so the tiles will be easier to remove. Finally, I’ve learned that all chisels are not created equal; in the end, I prefer a wood chisel because I can aim it with more precision than, say, a masonry chisel. Even though I think the hole was unavoidable because the tile was originally applied directly to the drywall, I was still frustrated when a big chunk of drywall came off with the tile. Now I have the opportunity to research drywall repair. Returning to the questions the class brainstormed to guide our blogging, I’ve discovered after one whole hour in bathroom renovation that it is important for me to get better at this form of creative play AND the play is rewarding in and of itself. I’m pretty goal-oriented by nature, so I’m not terribly surprised that it’s possible for both things to be true at once for me. Still, in re-reading this post a moment ago, I realized that I actually used the words efficient, successful, and mistake in describing my experience. These are words that aren’t typically associated with play, which in my mind has always connoted dalliance and aimlessness, yet they make perfect sense when I reflect on my activity. I think they’re also common to more organized forms of play like completing a crossword puzzle, mastering a lay-up in basketball, or managing a glissando in a piano sonata. And some other unpredictable words emerge in the last sentence: completing, mastering, managing. Because this is new territory for me, I don’t know that I achieved the state of “flow” described by Mihalyi Csikszentmihalyi, but I was intensely focused on my work–which didn’t really seem like work as I’m used to conceiving of it. Because I had an appointment afterwards, I had to set a timer to make sure I finished up in time. It was a good thing that I did because the time flew, and I didn’t want to stop working (playing?) when it went off. Despite that hole in the wall, I still feel a sense of accomplishment, largely because there is visible proof of my work (play?). One thing’s for sure: I’m not just engaged, I’m invested, in both the renovation and in thinking more about the roles that efficiency, success, completion, mastery, and management, might play in creative play. I’m not exactly sure if this is the space in which I am to respond to your post, but I will do this for now as it seems to make the most sense. I am also unsure as to what exactly should go into this response, so any future hints for improvement or direction would be welcomed. I am very interested in the activity you chose for your “creative play” as it is not something that would have come to mind for me. I suppose I associate home improvement with work more so than play, and you do talk about the different language you associate with both “work” and “play” (e.g. “efficient, successful, and mistake” for work), but it just seemed like an interesting choice. Also, in the second to last paragraph you seem to have thought of it as work at first too, but then placed the word “play” in parentheses as a question. I will be interested in seeing whether or not the activity changes for you not only in how you think about it, but also in the kind of work/play you do with it. One of the things that struck me was your comment that you are goal-oriented and that struck a similar chord in me as well. I noticed that when I was engaging in my own creative play I was viewing it as a task that needed to have an end product (and a product that I felt was well done, but that’s another trait of mine) instead of just participating in creative play for its own sake. I also appreciated that you brought our book by Csikszentmihalyi into your post and your thought process; it is something I will endeavor to do in the future as well. I think the biggest thing I have learned from this first week is how differently we might see and think about creativity and creative “flow.” I’m excited to keep working on my own creative play throughout the next few weeks and to see how your project along with my other classmates progress as well.